By Jean Shaoul – wsws.org: Israeli military forces killed two Palestinian paramedics and wounded at least 307 more, 131 of whom needed hospital treatment, during protests Friday in the Gaza Strip. The protests were held under the banner of the Great March of Return, as they have been over the last four months demanding the Palestinians’ right of return to their homes in Israel from which they or their families were driven out during the 1948-49 and 1967 wars. The Palestinian Ministry of Health named the two people who were killed as Abdullah al-Qatiti, 26, and Saeed Aloul, 55. It brings to more than 160 the number of Gazans killed since March 30. Tens of thousands more have been injured. According to Channel 10 news, the IDF was considering a short sharp operation on Gaza City to exert the maximum pressure on the Hamas leadership. This is the fourth such “ceasefire” and comes just three weeks after the last of three ceasefires in two months came into force. Tensions remain high, amid expectations that another military assault “to restore calm” could come soon. 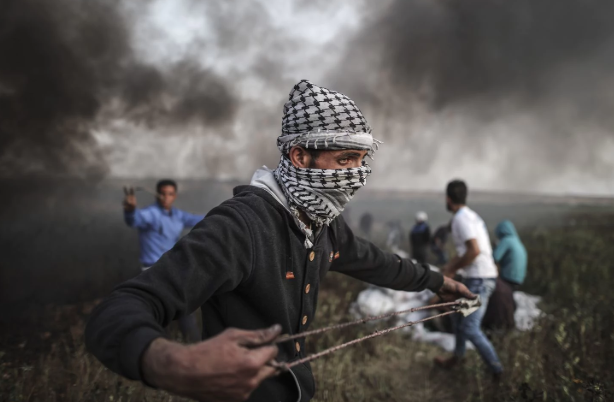 This latest round of fighting could torpedo a four-year truce between Israel and Hamas, including reconciliation between Hamas and the Palestinian Authority being brokered by the United Nations, Egypt and Qatar. According to Hamas, it had agreed to end the launching of incendiary kites and balloons into Israel in return for an easing of Israel and Egypt’s criminal blockade of Gaza. Israel had also promised to release dozens of Palestinians freed in 2011 from Israeli jails and then re-arrested prior to the war in summer 2014 in a second phase of the deal, in return for the handover of the remains of two Israeli soldiers killed during Operation Protective Edge in 2014, and the release of several Israeli civilians believed to be held by Hamas. The release of the Palestinians is an anathema to Prime Minister Binyamin Netanyahu’s nationalist coalition partners, particularly his rival, Jewish Home leader Naftali Bennett, and was due to be discussed at Thursday’s cabinet meeting. It was this, and the build-up of tensions with Gaza in the wake of the March of Return protests that led Netanyahu on August 2 to call off his trip to Colombia, planned for August 6-9. Earlier this week, the IDF carried out its most intense air strikes since its seven-week, murderous assault on Gaza in 2014. Its 150 “military targets” in Gaza were nothing of the sort. They included manufacturing facilities, alleged weapons depots and the five-story, al-Meshaal cultural centre in a densely populated area, which housed a theatre, library, offices for cultural associations and an office for Gaza’s Egyptian community. The strikes killed three Palestinians, including a pregnant woman and her 18-month-old daughter, and injured more than 30 people. The strikes started on Tuesday August 7, when an Israeli tank fired on a Palestinian border post, killing two members of Hamas’ militia, in what the Israeli military later claimed was a “mistake.” Its intelligence forces had thought that the militia was preparing to attack when it was, in fact, demonstrating its firepower at a ceremony for Hamas leaders. One of the guests at the ceremony was Saleh al-Arouri, deputy head of Hamas’ political wing, who had travelled to Gaza to discuss a possible Israeli “truce” with local leaders, after receiving a promise via Egypt that Israel would not try to assassinate him. Hamas rejected Israel’s “explanation” and once al-Arouri had crossed back into Egypt, responded by firing around 150 rockets into southern Israel. These homemade rockets, no more successful than the thousands of such rockets fired in recent years, largely fell on open ground, causing craters no bigger than saucepans and some minor damage. A few people were slightly injured, including a female foreign labourer working in a greenhouse. Israel’s Iron Dome defence shield intercepted some 30 rockets. Two longer-range rockets fired at the southern city of Beersheba, more than 24 miles from Gaza, caused no injuries or damage, which Hamas indicated was the work of a Salafist group that collaborated with Israel. A senior IDF officer warned that Israel was “rapidly nearing a confrontation” with Hamas in Gaza, saying, “Hamas is making serious mistakes, and we may have to make it clear after four years that this path doesn’t yield any results for it and isn’t worth it,” referring to the 2014 war. He added that reserve soldiers from air defence units were called up and he would call up more reservists if needed, with the military near to launching an operation in the Gaza Strip. Conditions in Gaza, which has been subject to an 11-year economic blockade by Israel, Egypt and latterly the Fatah-controlled Palestinian Authority on the West Bank, are appalling. Israel has recently imposed further restrictions aimed at preventing everything except medical and food supplies passing through the Kerem Shalom border crossing. World Bank data shows that Gaza has the highest unemployment rate in the world, at 44 percent, while unemployment among those aged between 15 and 29 is a staggering 60 percent. According to the Palestinian Central Bureau of Statistics, 53 percent of Gazans live below the poverty line, while 33.8 percent suffer deep poverty. Electricity is only available for four hours a day, while almost all water is contaminated by untreated sewage or salt. Tensions rose after US President Donald Trump announced his decision to move the US embassy from Tel Aviv to Jerusalem, exacerbated by reports that his special envoy, Jared Kushner, is seeking to annul the refugee status of millions of Palestinians and close the relief agency UNRWA. Encouraged by US support and the passage of the nation-state law that enshrines Jewish supremacy, members of Netanyahu’s coalition have submitted bills asserting Israel’s sovereignty over the West Bank or parts of it. Israel is riven with divisions, ranked second only to the United States as the most socially unequal member nation of the OECD. With a poverty rate of 22 percent—55 percent for Israeli Palestinians and one third for the country’s children—class tensions are growing. Israel’s rulers are deliberately whipping up militarism and war fever as a means of directing outward the immense social, economic and political tensions building up within Israeli society and diverting attention from the series of corruption scandals that have implicated the entire political establishment, from Netanyahu on down.